Croatia is hot. Lots of beautiful coastline. A great vacation destination. A burgeoning foodie spot. A long history of making wine. Croatia is so hot my brother, who once said he’d be happy to stay in New Jersey for the rest of his life, married a Croatian woman and has visited her family’s home three (or more) times. That’s how hot Croatia is. It’s so hot, it’s been burning for three years. Now, with about 33,000 hectares under vines — still more than double the amount of New Zealand — Croatia is looking to fight its way into a saturated global market when it enters the European Union in 2013. Currently, Croatia exports only 5 percent of its 60 million liters annual production, which helps explain why Croatians are third overall in wine consumption. If all goes well, I should be visiting this year. As reported in the Napa Valley Register, the the U.S. Department of Treasury’s Alcohol and Tobacco Tax and Trade Bureau has approved a 16th AVA in Napa Valley, Coombsville. One reason for the effort to designate Coombsville as a separate appellation is that its soils, geography and climate differ distinctly from nearby regions, according to a news release from the group. It noted that the Coombsville soils are dominated by the volcanic rhyolitic tuff — sedimentary rock and lava flows — of the Vaca Range on the eastern side of the Napa Valley. You’re in France and growing grapes in the Rhone Valley, but you want your region to be special, to have its own name. So you apply to the Institut National des Appellations d’Origine, known as the INAO. The Rochester Democrat & Chronicle reported on a meeting where Dennis Rosen, the chairman of the state liquor authority, covered the impacts of a 2005 law that increased the ability of in-state and out-of-state wineries to ship in and out of New York. Guess what? The liquor authority has collected $431,375 in permit fees from wineries in the 15 states [with reciprocal shipping agreements]. Wineries that shipped directly reported $54 million in sales to New York consumers between March 2009 and February 2010, which yielded about $4.5 million in sales taxes. Here’s a good reminder of what ripasso means in the Veneto. It comes courtesy of George Elde, salesman for Frederick Wildlman, a venerable wine importer and distributor in New York, where, it’s true, I have a number of friends. Like many sales reps, George sends out e-mails re deals, steals and reals, that reflect their portfolio. Let’s check out the 2009 Santi ‘Solane’ Valpolicella Classico Superiore DOC. Santi Valpolicella Classico Superiore is a “ripasso” method Valpolicella, meaning that following primary fermentation the wine sees a second fermentation with the addition of Amarone grapes and skins, creating a richer, more complex and more exciting final wine. Santi Solane is sourced from estate vineyards within the original Valpolicella appellation of Valpolicella Classico. When primary fermentation is complete in early winter, grapes, skins and pomace from Santi’s Amarone are added to the vats. The additional sugars from the Amarone trigger a second fermentation, which adds additional layers of complexity, rich fruit and structure. The wine is blended and then aged for more 3-5 months in small oak cask followed by an additional 12 months in larger neutral casks prior to bottling. The finished wine has 70 percent corvina and 30 percent rondinella, typical grapes for the region, (but how could you tell?) excluding the third usual suspect of molinara. This is interesting. Unlike the Italians, the French are very protective of designating their vineyards. The Italians, however, don’t have anything quite like Grand Cru. means literally ‘great growth’ in French. In Burgundy’s Côte d’Or a grand cru is one of 34 particularly favored vineyards, a decided notch above premier cru. In Alsace, grand cru is a recent, elevated appellation accorded several dozen specific vineyards. In Bordeaux, the words grand cru usually apply to a specific property or château and depend on the region in which it is located. Anywho, about the Pellegrini 2005 Estate Merlot. They say on the label that it’s unfiltered and is 13 percent abv. Russell Hearn was definitely on the job then in the cellar. 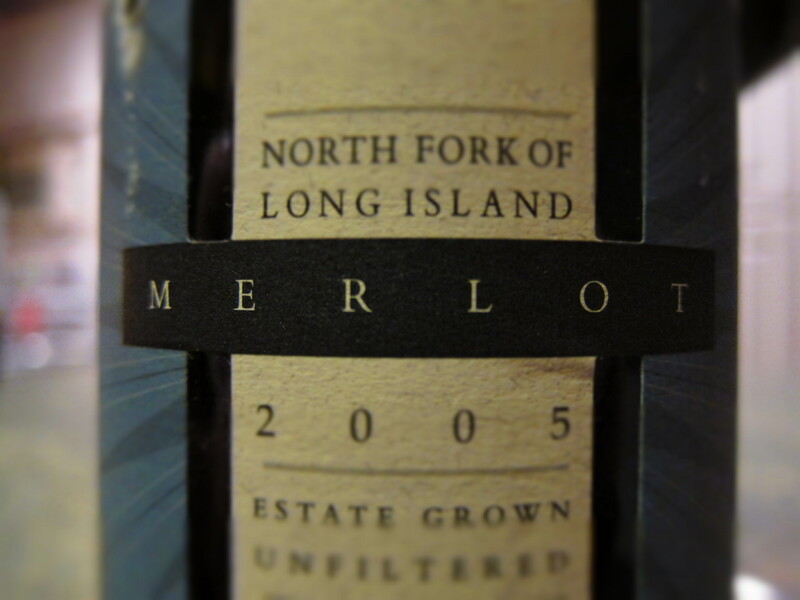 The wine is opaque, ruby red with black inflections and a thin pink rim, a nice bright color for a six-year-old wine. It has a lightly intense fruity smell, which I wish I could another way to describe, but it smells like those raspberry, blackberry candies that have small candy balls covering them so they look like fruit.